Hello! Welcome to Ambrosia Bears, a hospital for vintage and antique teddy bears, and for soft toys. Before you enter the site, Ambrosia herself - the gorgeous, dark pink bear back centre waving at you - would like to introduce you to some of her friends. Ambrosia and her helpers believe that something can be done for every beloved teddy bear (antique or vintage) and soft toy. She is willing to try and help absolutely anyone who comes to her, so whether your beloved friend has been attacked by a naughty dog or puppy, or simply needs some new paw-pads or a growler, Ambrosia will help. In every instance, particularly with older bears, Ambrosia does her utmost to maintain their original character. Should distinguishing features of particular bears have been lost to time (for instance, the tell-tale pattern of claws on a Chiltern bear), Ambrosia will restore these characteristics where appropriate. She will also do her very best to try to identify your bear for you, should you be in any doubt! Ambrosia is helped by numerous bears, but there is a central, dedicated group who all have their own stories to tell. Here they are! Ambrosia does not like the idea of hierarchies in the slightest, although she owns the hospital as well as the site! Everyone regards her as the 'leader' although she always denies this, and says that the hospital is run by, and belongs to, them all. She is a beautiful bear made from Alpaca, and is extremely kind. She will help any bear or toy who come sot her for help, and offers a home at Ambrosia Place without question to those who wish to stay. Several of those who help with the repairs came to the hospital is a dreadful state and simply stayed on to help others. Pudding is a gorgeous Chiltern bear from the 1940s who arrived at the hospital one day several months ago in terrible condition. After Ambrosia had finished helping him, he simply stayed at Ambrosia Place and helps out as much as possible with caring for poorly bears; he is never far away from Ambrosia. Raku is an absolutely gorgeous bear; we think he is an early, silk bear from Poland or East Europe. He was discovered in a filthy state, having been left in a garage on his own for many years. Now he looks fantastic and helps out at the hosptal whenever strength is needed due to his size. The Duke of Seville is the newest resident at Ambrosia Place! He was simply sold at auction as part of a house clearance and was very lonely and sad when he arrived. But, once Ambrosia and the others restored him to his former glory, he felt lovely again and asked if he could stay and help out at the hospital. Everyone was thrilled that a Merrythought bear was now part of the family. Winterbourne, a Chad Valley from the 1950s, is another rescue bear himself, and, after he was restored, he, like Pudding, stayed on to help other bears and toys who were in distress. Winterbourne seems to have a special talent for mixing up the rights herbs and flowers to make the potion which helps the patients sleep. And all of the bears were overjoyed when they finally got a little sister! Isabelle, a beautiful 1940s Chiltern, simply came to stay at the hospital to help out. They all had a huge party for her and the boy bears are extremely protective of her because she is so sweet and so precious. 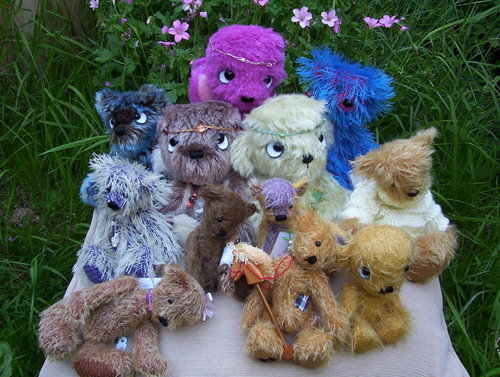 All of Ambrosia's bear friends, and herself, of course, are entirely hand-stitched from a wide variety of top-quality German mohair - string, sparse and dense - in a lovely array of colours; others are made from luxury fake fur which is so soft the bears made from it are very difficult to put down! Each little bear - or big bear - has glass eyes and cotter-pin joints, so they are nice and sturdy. All have been filled with poly-fibre and natural weighting which makes these bears much heavier than the soft toys bought in shops. 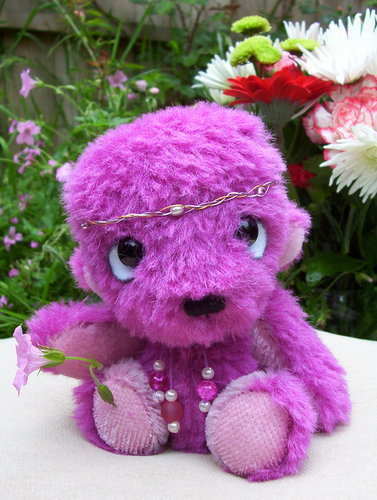 Remember that every Ambrosia Bear is a one-of-a-kind original; no-one else will have a bear exactly like yours! Each Ambrosia Bear takes between five to seven days to make, from cutting out the material, to hand-stitching (no use of a sewing machine on Ambrosia Bears! ), to adding the final touches. This may sound a long time, but it ensures that each bear is made to an excellent standard, and gives us time to add those extra bits which give them their adorable, individual quirks and characteristics. Many are happily playing with little toys, some look lovely in their necklaces and circlets, some are snuggly in hats and jumpers, but others just want a cuddle and somewhere safe to stay! If you see a pattern style that you like, and would like one custom made in a mohair type and colour of your choice, we'd be more than happy! Simply contact us. Ambrosia has also recently opened a bear hospital, so, should one of your bear friends be in need or some tender loving care and a bit of a repair, just click here and here to see some of the bears that Ambrosia has already helped. She will always do her best to try and mend any bear. Just text her a picture of your bear friend, and she will get back to you! Please be awrae that, under no circumstances, is Ambrosia able to work with materials such as leather and bone - for obvious cruelty reasons! Everything and every-one at Ambrosia Bears are utterly against harming anything or anyone! Send a photo and description of requirements: just email or WhatsApp Nicola on 07 986 976 888. Texts will not be answered. I'll ALWAYS, without exception, require a description, the size of the bear/toy and a photo or two! No photo, no size, no quote! PLEASE DO NOT RING JUST TO ASK HOW MUCH IT WILL COST! PHOTO AND SIZE REQUIRED!